So I’m off on the latest adventure! 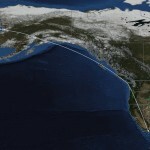 This one has me flying with a new crew to an old home of mine, Alaska. Boy, what a place! I lived in the state when I was a kid, but haven’t been back since then. I had lived near Anchorage, which has 300,000 residents and is home to nearly half of Alaska’s entire population. This trip was going to take me to a village which was literally a thousand miles away from where I’d lived, yet was still within the same state. Alaska is like that. It’s so large that you could divide it in half and instantly make Texas the 3rd largest state. Hard to believe that the United States purchased Alaska for only $7 million, or less than $0.02 per acre. And even then, the purchase was so derided by the public that the state was referred to as “Seward’s Icebox”. Much like California, it was the discovery of gold which put the state on the map. Anyway, one of the best things about the on-demand charter job is that it will take you places you’d be unlikely to have reason to visit on your own, and this is definitely one of those trips. 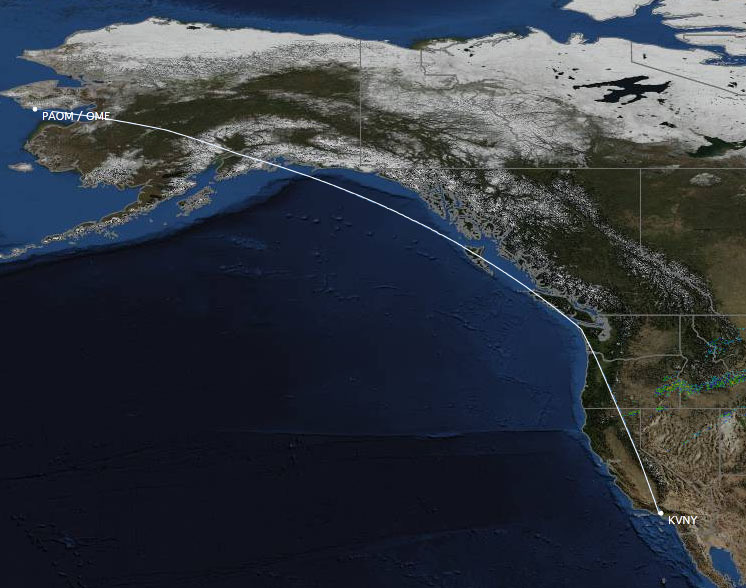 We departed Van Nuys bright and early with a full load of fuel and touched down six and a half hours later in the arctic northwest town of Nome. This wasn’t the passenger’s destination, but rather a place to stop for fuel and a crew change. The plane went on to China with a different crew because under Part 135 rules, pilots are limited to 10 hours of flying per day and the total flight time for the two legs is far beyond that. 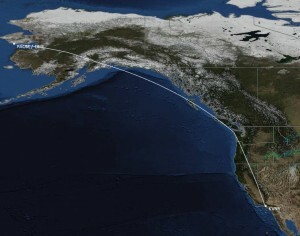 However, we’re staying in town because the plane is returning to Nome for a fuel stop tomorrow and we’ll crew-swap again before flying on to New York. 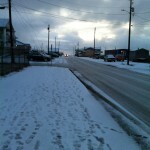 The "main drag" in Nome. This is as congested as it gets here! It was snowing when we landed, and by the time we shut down the engines on the ramp it had progressed to a full blown snow storm with 20 mph winds. The short walk from the jet to the FBO left my coat soaked from the heavy, wet snow. I’d checked the forecast weather before departure and it was calling for temperatures around freezing. Unfortunately I’d neglected to account for the wind chill and am paying the price when we walk around outside. The guy I’m flying with has it even worse. He left on a trip to west Africa and had packed for that climate, not knowing he’d be sent to the arctic circle on the next flight! Strangely, the difference between the daily high and low temperatures has only been a couple of degrees. The high was 32 and the low 30 degrees. Since we’ve been here, it’s been a random combination of rain, snow, sleet, ice pellets, and wind. After getting settled in the hotel, we set off on foot to see the town. It didn’t take long. Nome is a large town by regional standards, but for those of us from Southern California, it’s quite small. There are only 3,000 residents here, most of whom seems to be native American. 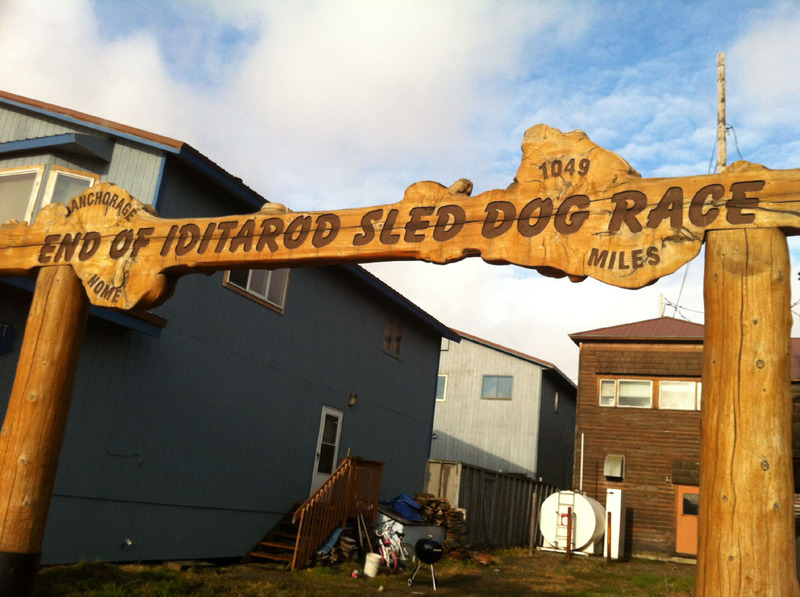 The town is most famous as the finish line of the annual Iditarod Trail Race, a 1,049 mile dog sled race which begins in Anchorage and commemorates a heroic 1925 transport of diphtheria antitoxin to the region by dog sled in order to stave off a deadly epidemic. The Iditarod in an endurance event of epic proportions, almost a Badwater Marathon in the snow. They brave some of the most challenging weather and terrain imaginable — climbing 5,000 foot mountains in blizzard conditions with wind-chill adjusted temperatures of as low as 130 degrees below zero — and still manage to travel 1,000+ miles in as little as eight days. 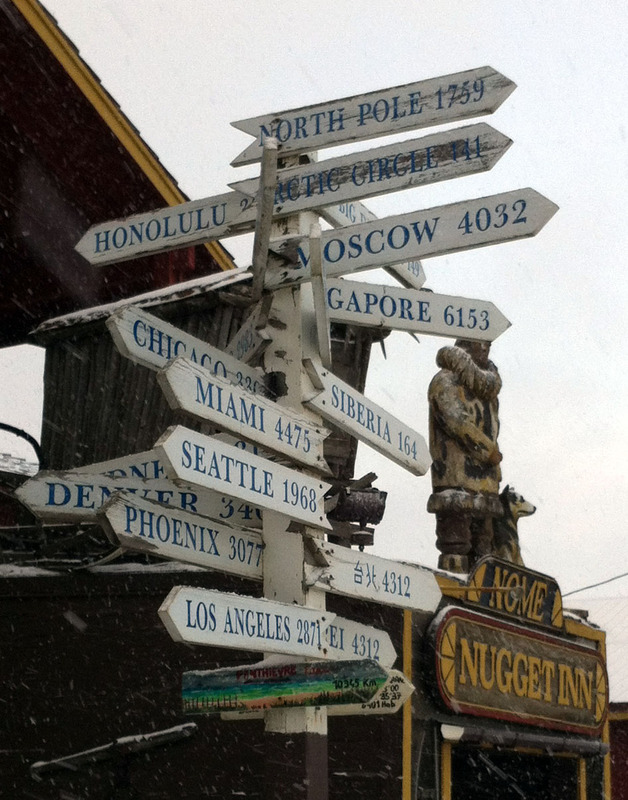 Unless you're headed to Siberia, Nome is a long way from anywhere. 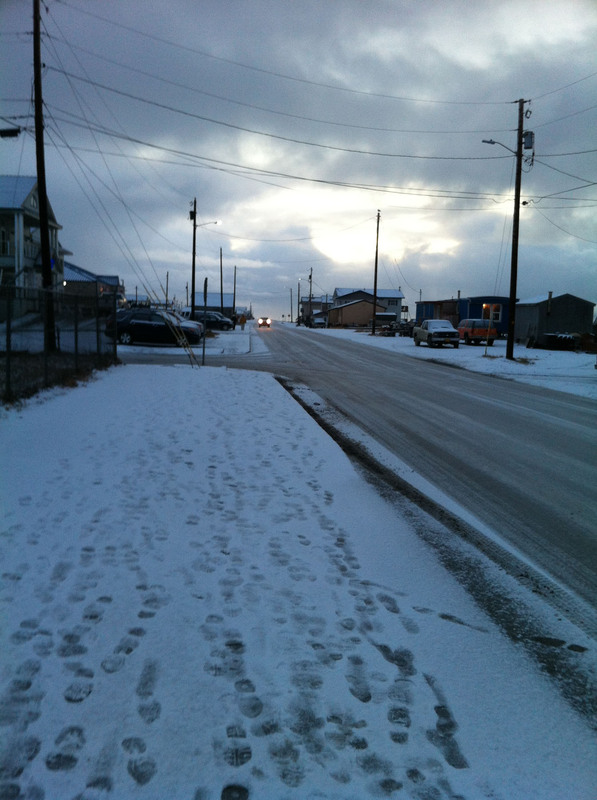 Nome looks out on the Bering Sea, and while there are a few towns further north, there’s not much further west. 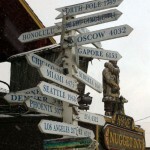 In fact, we came across a stack of directional signs which claimed Siberia is only 164 miles away. 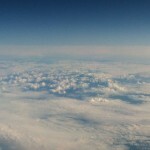 I’m tempted to say we can see Russia from here, but Sarah Palin beat me to the punch. 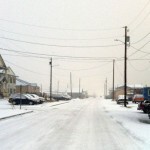 Government seems to be a major employer in Nome. Native Village Council, Board of Trade Office, Army National Guard, etc. Even the FAA has an office in town, along with a Flight Service Station at the airport. I’d read about Airport Advisory Areas and taught students about them for years but had never come across one in the real world. I was starting to think they didn’t really exist! I think transportation is also a big deal around here. I don’t know of any other town this size with an airport as large as Nome’s. Bering Air has a sizable fleet of Caravans, Beech 1900s, and King Airs which service the region. Right after we arrived, an Alaska Airlines 737 arrived from Anchorage. In fact, there are actually two airports here, along with a harbor and a rudimentary road system which closes for the winter on October 31st. Despite the cold, it’d be interesting to be here in the dead of winter when even the sea is frozen solid. 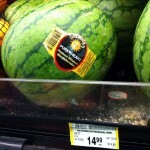 This watermelon would cost about a dollar in Southern California. The shock of the wind chill is nothing compared to the sticker shock of buying… well, just about anything around here. We visited a supermarket (or should I say, the supermarket) and noticed that a mini-watermelon which costs about a dollar back home runs fifteen bucks here in Nome. Gas is $6.00 per gallon. A gallon of milk is nearly $10. A six-pack of Coke is about the same. We bought a pitcher of local beer (“local” being from Anchorage, a thousand miles away) for $25 bucks. An omelet is $18. That’s what happens when everything in town has to be flown in. I was sure that seafood would be the one thing that was cheaper here than in L.A. After all, this is where stuff like King Salmon comes from. There’s even a town in Alaska named King Salmon! Alas, seafood is pricey in the arctic just like everything else. Rents, leases, and wages are high here as well. There is no state tax or sales tax in Alaska, but Nome has a 5% local tax which they add to most things. For a small town, they sure do put out a big welcome mat! Despite having a population of only 3,000 or so people, the town has six bars, two liquor stores, seven churches, a major airport, a marina, and a regional hospital. In some ways it reminds me of Reno, the “biggest little city in the world”. In other ways, it’s the smallest of backwoods towns. Until you look at the surrounding communities, of course. They’re even smaller. Well, we’re departing at 5 o’clock in the morning tomorrow for the east coast, then back to Southern California the following day. It’s been quite an experience visiting this wintery wonderland. It has reminded me of and made me thankful for all the comforts and conveniences of home that I frankly take for granted. Despite traffic jams and the other drawbacks of a major metropolitan area, all of us down there are quite blessed. 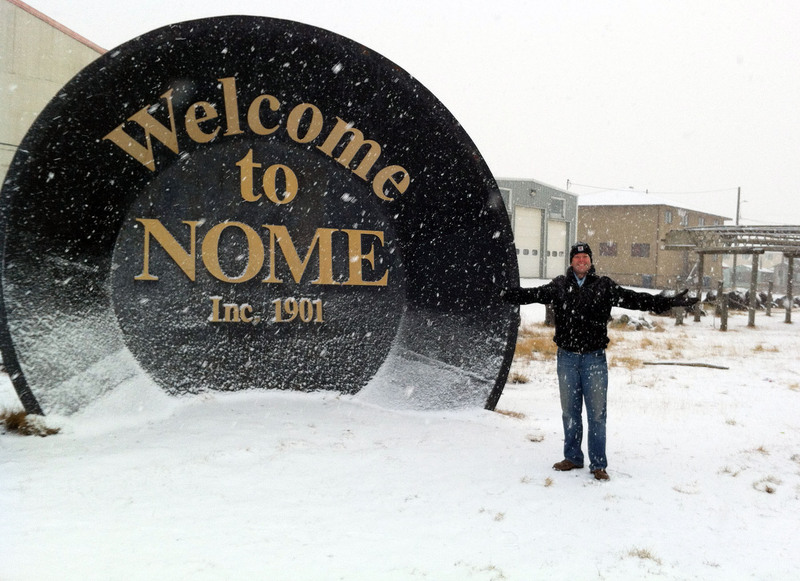 From temperate weather to cheap food, there’s no place like Nome… er, I mean “home”. 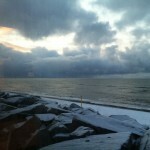 Looking out at the Bering Sea as a storm heads toward the town. 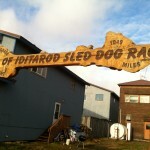 The finish line of the Iditarod, an annual 1,000+ mile dogsled race from Anchorage to Nome in the dead of winter. Flying over Seaside, Oregon and looking west toward Mt. St. Helens (center), Mt. Rainier (left), and Mt. Hood (right). 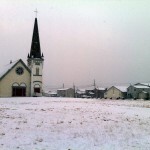 Nome has only 3,000 residents, but it’s home to seven churches… and six bars. Unless you’re headed to Siberia, Nome is a long way from anywhere. It’s a little bleak, I’ll grant you that. 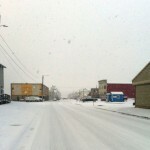 I believe this is what serves as rush hour in northwest Alaska’s largest town. 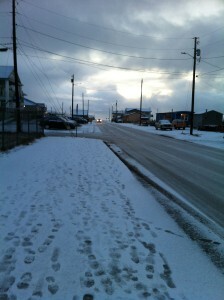 The “main drag” in Nome. This is as congested as it gets here! 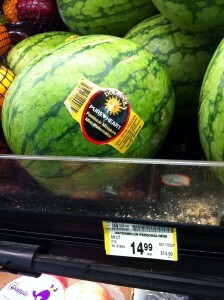 A mini-watermelon which costs $0.99 in California costs $15 bucks up here. 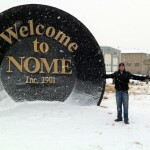 Nome may be a small town, but it welcomes visitors in a big way.